There are many different types of roof types used on buildings. 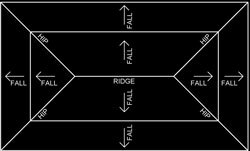 Below is a description of the basic types of roofs used and what they look like when drawn in plan view and in isometric view. 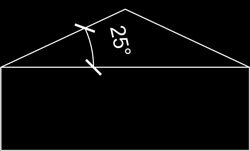 Roof Pitch - The roof pitch is the angle that the roof slopes at in degrees. 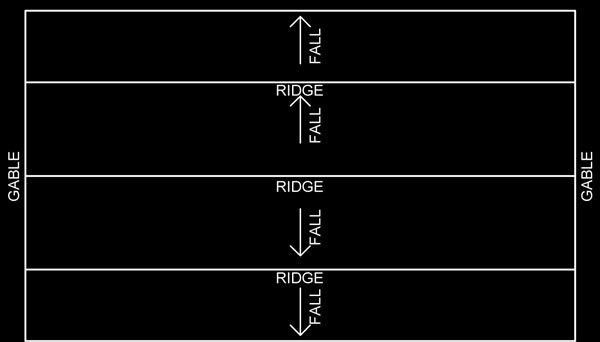 Sometimes referred to as the slope or angle, but the correct term is pitch. 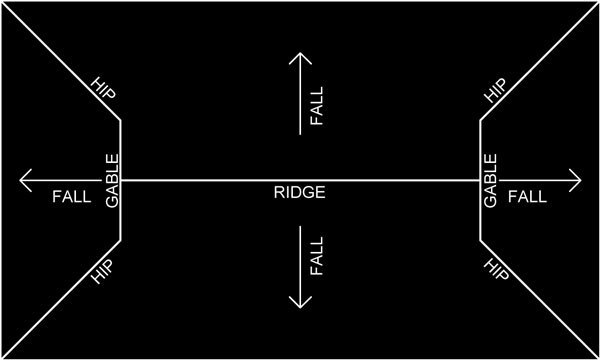 The greater the pitch, the steeper the roof is as shown in the diagrams below. Roof Ptch - In this example, the pitch is 25degrees. Roof Plane - This describes a single side of the roof. For instance, a simple singular gable roof is made of 2 planes as it has 2 sides of the roof. For more examples, look at the illustrations below, I have included the number of planes shown in the description. 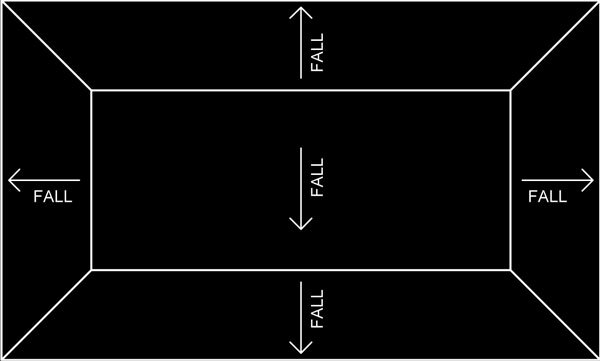 Fall - When drawn on a plan, this shows the direction the roof plane falls towards. 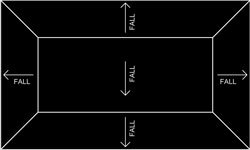 The fall usually is shown in the direction going towards the gutter or box gutter. Plan View In this roof type, the roof is made up of what are called hips. 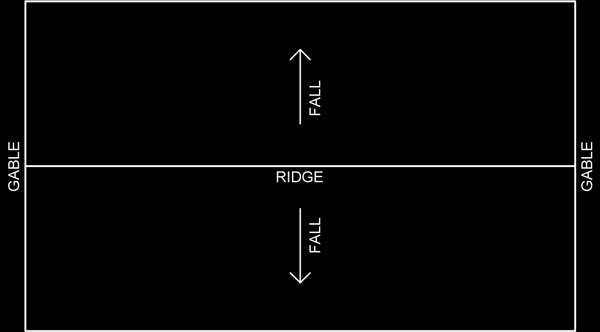 The hips are usually drawn at 45degree angles, unless there are 2 different roof pitches involved, then the hips are not at 45 degrees. At the top of the roof is the ridge. In this example the, roof has 4 roof planes. This is a good roof style for use in cyclonic areas as there are no high walls exposed to wind forces like there are in gable roofs. 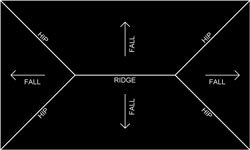 Building a hip roof has more structural members required to build it compared to a gable roof. 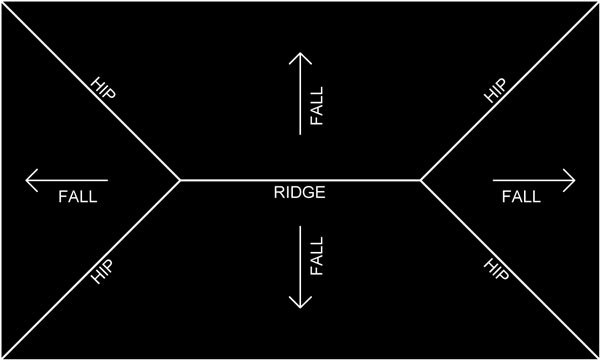 In this roof type, there are 2 planes only with a ridge at the top. 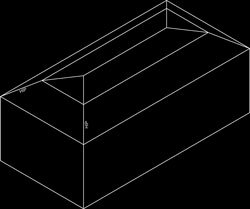 This is one of the easiest roof types to draw and also build. 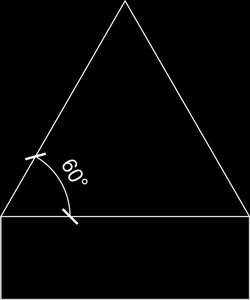 A gable is basically a triangle shaped roof. 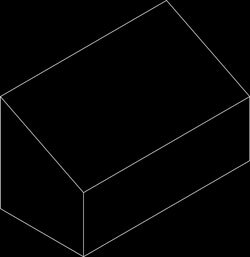 In this example the, roof has 2 roof planes. Gable roofs are not a good choice for cyclonic areas due to the large gable end walls that are exposed to wind forces. 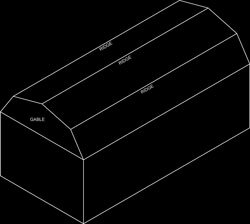 Plan View This roof type is a combination of a hip roof and a gable roof. It is primarily a hip roof with a gable added on. Dutch gable styled roofs add a bit more design feature to a standard hip roof. Plan View This roof type is a single slope that can be any pitch. It is also called a lean-to roof. Also an easy roof to build. 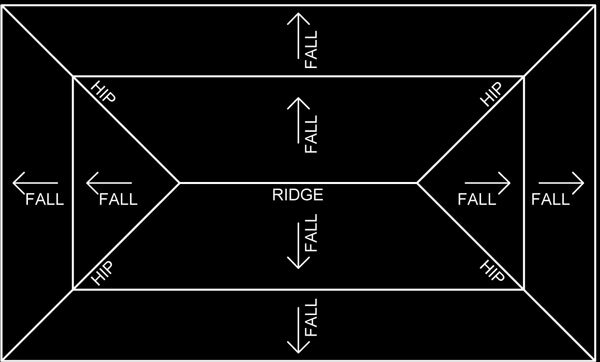 Note that a flat roof looks the same in plan view as a skillion. 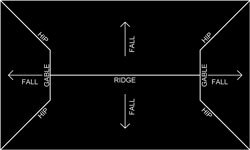 The difference is that a flat roof is usually 5 degree pitch or less. 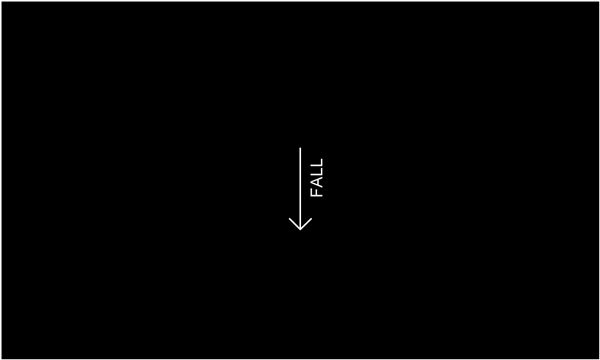 In most cases, flat roofs are just 1 or 2 degrees. In this example the, roof has 1 roof plane. Cheap and easy roof to build. This roof type is a basically a hip roof with another roof on top of it. The roof on top is usually a flat roof. The flat roof is not entirely flat as it will need to drain off rain water. 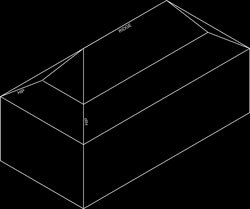 In the examples below, I have shown a flat roof mansard and a dual pitch hip roof mansard. In this example the, roof has 5 roof planes. 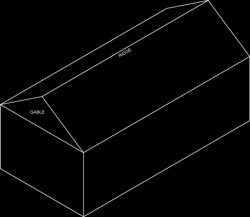 This roof type is a basically a gable roof with 2 pitches. The lower pitch is usually steeper than the upper pitch. Often seen on barns. Can be a good roof design to allow for good attic space. 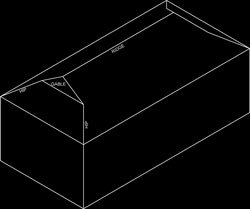 This roof type is a basically a hip roof with 2 pitches. The lower pitch is usually shallower than the upper pitch. In this example the, roof has 8 roof planes.